Simply send us details, these can include drawings, fabric specifications and approximate measurements for quotation. We will contact you to resolve any queries and provide you with our quotation. If you have not specified a fabric, or need to some assistance with fabric options, we are able to send out swatches based on your brief, or if required we can come and visit you to discuss fabric choices and project details. 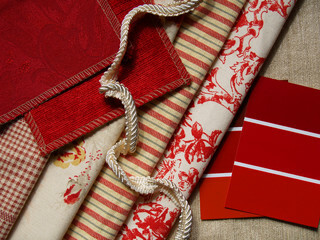 We can assist you with coordinating fabric choices for your scheme. Mood boards showing a selection of fabric swatches along with your upholstery, carpet and wall colours can be produced either on boards, or supplied digitally as PDFs. In the case of a digital mood board, swatches of the chosen fabrics would be sent to you too. Once a quotation is approved, we will request a purchase order or written instruction to go ahead. We will arrange for one of our skilled fitters, based country wide to come and do a final site measure. Final site measurements will be used to process your order. At this stage if there are any significant changes to the original measurements or specification, the quote will be revised accordingly, and a new purchase order along with written approval of any changes will be required. We will require a fitting date, and contact details of the on site manager or contractor in order to co-odinate delivery and fitting with your refurbishment schedule. We deliver direct to site anywhere in the UK. Delivery times will vary according to the complexity of the job, however we pride ourselves on meeting our clients deadlines.